Ideal facilities for small parties off season, two families with children in high season and groups (painting classes, travellers for the Compostella route, etc etc). The manor house, Langans, was established in the first half of the eighteenth century as a merchant house for a well-to-do Italian family in the little hamlet Fajolles. Shops are ten minutes away. The owners will gladly provide you with your first needs on arrival. Partly used as living quarters, and partly as wine press and storage the house offers ample space. 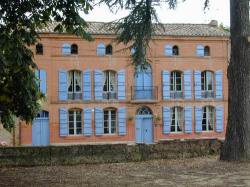 A major part of the house has been transformed into a spacious gite. The owners - Matthew and Ellen - may be around in the second part of the manor and are very willing to be of any assistance to make sure your stay is a great one. The gite has its own entrance to ensure complete privacy. After entering at the end of the hall there is the former wine press room which is converted into a spacious dining room/kitchen area and a den with entrance to the terrace and swimming pool. The kitchen is equipped with dishwasher and washing machine. In the den a radio/CD player is available. The terrace has a large alfresco area with fixed barbecue and large dining table. Deck chairs and further furniture are plentiful. The swimming pool has Roman steps for easy access and is partly shaded by trees like bamboo and eucalyptus. 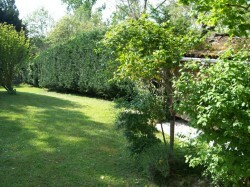 A secluded garden provides full privacy. Upstairs the first floor provides three double bedrooms overlooking garden and pool (each ensuite with shower or bath/toilet/washing basin). The second floor provides a double bedroom and a twin bedded room with a bathroom ensuite (with bath/toilet/washing basin).